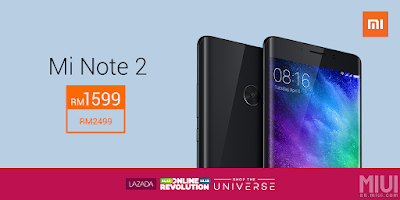 11.11 Sale on Mi Malaysia Store on Lazada: We have the Mi Note 2 (6GB+128GB) - Instead of RM2499, you can get it for RM1599!! Yes Mi Note 2 got a 36% discount! How great is that? Even the visit Malaysia / Malaysia year end sale also lose I tell you!